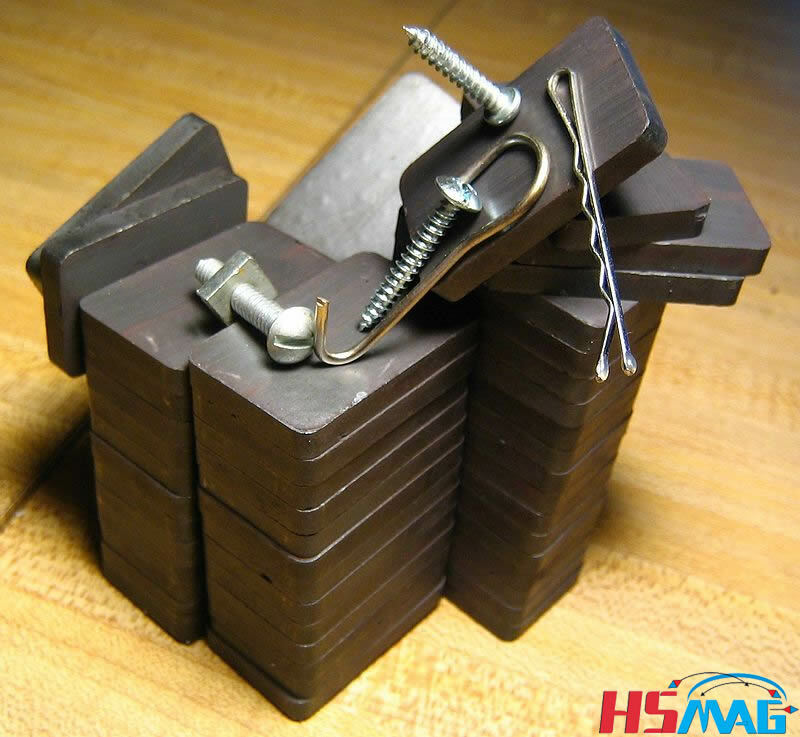 A ferrite (Ferrite Magnets) is a type of ceramic compound composed of iron(III) oxide (Fe2O3) combined chemically with one or more additional metallic elements. They are both electrically nonconductive and ferrimagnetic, meaning they can be magnetized or attracted to a magnet. Ferrites can be divided into two families based on their magnetic coercivity, their resistance to being demagnetized. Hard ferrites have high coercivity, hence they are difficult to demagnetize. They are used to make magnets, for devices such as refrigerator magnets, loudspeakers and small electric motors. Soft ferrites have low coercivity. They are used in the electronics industry to make ferrite cores for inductors and transformers, and in various microwave components. Ferrite compounds have extremely low cost, being made of iron oxide (i.e. rusted iron), and also have excellent corrosion resistance. They are very stable and difficult to demagnetize, and can be made with both high and low coercive forces. Ferrites are usually non-conductive ferrimagnetic ceramic compounds derived from iron oxides such as hematite (Fe2O3) or magnetite (Fe3O4) as well as oxides of other metals. Ferrites are, like most of the other ceramics, hard and brittle. Many ferrites are spinels with the formula AB2O4, where A and B represent various metal cations, usually including iron Fe. Spinel ferrites usually adopt a crystal motif consisting of cubic close-packed (fcc) oxides (O2−) with A cations occupying one eighth of the tetrahedral holes and B cations occupying half of the octahedral holes. If one eighth of the tetrahedral holes are taken by B cation, then one fourth of the octahedral sites are occupied by A cation and the other one fourth by B cation and it is called the inverse spinel structure. It is also possible to have mixed structure spinel ferrites with formula [M2+1−δFe3+δ] [M2+δFe3+2−δ]O4 where δ is the degree of inversion. The magnetic material known as “ZnFe” has the formula ZnFe2O4, with Fe3+ occupying the octahedral sites and Zn2+ occupy the tetrahedral sites, it is an example of normal structure spinel ferrite. In terms of their magnetic properties, the different ferrites are often classified as “soft” or “hard”, which refers to their low or high magnetic coercivity, as follows. Ferrites that are used in transformer or electromagnetic cores contain nickel, zinc, and/or manganese compounds. They have a low coercivity and are called soft ferrites. The low coercivity means the material’s magnetization can easily reverse direction without dissipating much energy (hysteresis losses), while the material’s high resistivity prevents eddy currents in the core, another source of energy loss. Because of their comparatively low losses at high frequencies, they are extensively used in the cores of RF transformers and inductors in applications such as switched-mode power supplies and loopstick antennas used in AM radios. Cobalt ferrite, CoFe2O4 (CoO·Fe2O3), used in some media for magnetic recording. 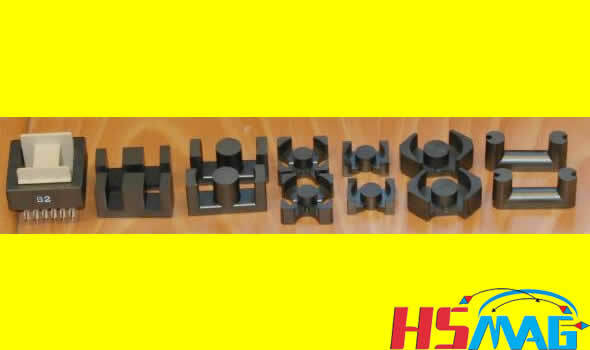 Ferrite magnets (Ceramic magnets) are sintered permanent magnets composed of Barium or Strontium Ferrite. This class of magnets, aside from good resistance to demagnetization, has the popular advantage of low cost. Ferrite magnets are very hard and brittle, and require specialized machining techniques. Moreover, they should be machined in an unmagnetized state. We are equipped to machine these materials to specifications. Anisotropic grades are oriented in the manufacturing direction, and must be magnetized in the direction of orientation. Isotropic grades are not oriented and can be magnetized in any direction, although some degree of greater magnetic strength will be found in the pressing dimension, usually the shortest dimension. Due to their low cost, Ferrite magnets enjoy a very wide range of applications, from motors and loudspeakers to toys and crafts, and are the most widely used permanent magnets today. Injection Molding: Ferrite powder is mixed into a compound and then injection molded in the same way as plastic. Tooling for this manufacturing process is usually very costly. However, parts produced through this process can have very intricate shapes and tight tolerances. Injection molded ferrite properties are either lower or about the same as grade 1 Ferrite. The corrosion resistance of Ferrite is considered excellent , and no surface treatments are required. However, Ferrite magnets may have a thin film of fine magnet powder on the surface and for clean, non-contaminated applications, some form of coating may be required. Up to about 840F, changes in magnetization are largely reversible, while changes between 840F and 1800 F are re-magnetizable. For all Ferrite magnets, the degradation of magnetic properties is essentially linear with temperature. At 350F, about 75% of room temperature magnetization is retained, and at 550 F, about 50% is retained.